I remember seeing this quote when I was deciding whether to move to New York City from Cleveland, Ohio. I spent a lot of time thinking about what I was going to do, and I finally decided to stop thinking and just DO something. Moving to NYC helped me learn a new lifestyle, lose weight, and changed my perspective on how I see the world and the people in it. What have you been planning that you should just be doing? Are you living in the moment? How can you quiet your mind so that you can just enjoy what’s happening right now? Breakfast really is the most important meal of the day when you’re losing weight (read more here http://www.m.webmd.com/diet/features/lose-weight-eat-breakfast). During my weight loss I would wake up, drink a small amount of water, go for a jog, and then eat breakfast. Sprinkle flaxseed over your chosen cereal, add the dried fruit, and skim milk and enjoy! Wake up 15 minutes earlier to make sure you have time to make this simple breakfast. After a few weeks of eating a healthy breakfast combined with exercise and healthy eating daily you’ll see results! Is there something you’ve been dreaming of that you’ve always wanted to do? What can you do today to move towards making that dream a reality? Write it down if you have to, hold yourself accountable. How will you feel if you achieve that goal? Is there something you’ve wanted to do that you haven’t? What’s stopping you? Is what’s stopping you enough of a reason never to do what you’ve always wanted? The foolish man seeks happiness in the distance. What makes you happy? What can you do today to move yourself closer to happiness? Will your happiness improve the quality of life for those around you? Take a moment today to think about how you can grow happiness in your life using what you already have access to. You can have the most mind-blowing accomplishments on your mantle or have had the most illustrious career. You can be the most giving, saintly creature on Earth or have the sharpest sense of humor there ever was. Add to any of the above some extra pounds and that is all people refer to and talk about. I know a handful of people who are remarkable men and women who have made incredible contributions to society. They also struggle with their bodies. A few of them are obese, others are pleasantly plump. While the latter are lucky enough to hear the occasional snide comment, the former hear nothing but words about their weight. During my time in New York City I’ve learned so much. One of the main lessons has been that everywhere you go, there you are. Changing yourself and the way you relate to others isn’t easy but it is possible. What kinds of changes do you want to make in your life? Can you see the impact those changes will have on the people around you? What small steps can you take today to make a positive change in yourself? A Shape Up NYC Success Story! When Jessica Brickey relocated to New York City from Cleveland in 2010, she hoped to leave behind an unhealthy lifestyle. “You’re driving everywhere in your car, you’re stopping at drive-throughs, sometimes more than once a day. We had a lot of white bread,” Jessica described to members of NYC Parks’ Central Recreation team. At 212 pounds, Jessica struggled to find exercise routines she could maintain long-term. Today, Jessica, 26 and a North Bronx resident, weighs 135 pounds — and she found her inspiration for healthy living through Shape Up NYC. In her first months as a New Yorker, Jessica was frustrated that her habits hardly shifted. She struggled with subway stairs, was exhausted at the end of the workday, and found fast food an easy crutch. She joined a local gym, but found the staff and atmosphere unwelcoming. A clinical social worker trained to help clients with few resources, Jessica found information on Shape Up NYC online and went to her first kickboxing class at Harlem Hospital. She loved instructor Lynze Schiller’s class, even though she initially had trouble finishing. 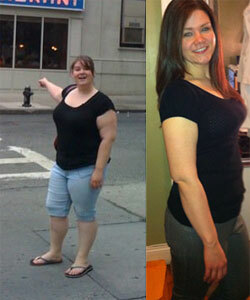 Jessica began attending Lynze’s Shape Up classes twice weekly, and immediately saw results. She lost two pounds per week until she hit 180 pounds. When her weight loss leveled, she increased her workouts to seven days per week, with four days of intense cardio. “She’s just one of the students that week after week everybody could always see her commitment and the change of her body. That becomes very inspiring to other students as well,” said Lynze. Jessica is pursuing a personal training certification so she can help others achieve health in the same way Lynze inspired her. “I focused on, ‘what do I want,’ not what can’t I do,” said Jessica. Shape Up NYC is free fitness program run by NYC Parks, in partnership with Equinox, Empire Blue Cross Blue Shield, and NYC Service. Shape Up currently offers more than 160 classes throughout the five boroughs. This fall an additional 40 classes will be added through funding from Mayor Bloomberg’s Obesity Task Force. “Our greatest weakness lies in giving up. Have you ever heard someone refer to you as “the fat girl/guy”? If you have, you know how painful this adjective is. Being fat in our society is painful, but being thin doesn’t solve the problem. I always imagined that once I lost weight I would feel confident and secure with myself but I’ve learned the hard way (like I always do) that it takes more than dieting and exercising to improve your self-esteem. 3. I’m happy and healthy! It would be great if life’s experiences fit into these pretty little categories, but unfortunately they don’t. After the weight is gone, and you see yourself in the mirror as a new person, you seem to find more things you want to work on. This experience is not uncommon of people who lose weight especially significant amounts of weight. Unfortunately there isn’t a show following people after their weight loss, and while there are successful people there are also people who continue to feel unhappy despite their new appearance ultimately leading to destructive behaviors and weight gain. I’ve learned the hard way that you have to do more than just eating right and exercising after you lose weight to get used to your new life. Apparently it’s just as important to focus on your thoughts as it is to focus on your actions as you move forward in your “new skin“. A woman I used to work with would greet me each morning, compliment my weight loss, and always end our encounter with “don’t gain it back”. While I’m sure she didn’t mean to be offensive, I found her comment rude and felt pressured by my new appearance. It’s a scary thought to imagine that all of the hard work I put into losing weight could be taken away with just a few bad choices on a daily basis. I’ve seen stories of others who’ve regained weight, and I myself previously lost a significant amount of weight in a short period of time only to find myself heavier and unhealthier than ever just a few months later. The difference for me at this point in my life has been my commitment changing my lifestyle. Every day I make better choices about eating and exercising, and it’s the little choices that will help me to maintain my health and fitness in the long run. The challenge after the weight loss for me this time has been how to match the old “fat” Jessica with the new “skinny” Jessica. When I speak about myself in the third person I’m referring to my personality, my values, my beliefs, and all the things that make me recognizable (besides my looks) to those who know me best. <When I use the words “fat” and “skinny” they are in quotations because that’s what adjective people have actually used to describe me.> People act in accordance with how they are perceived by themselves and by others. My perception has been drastically altered as my appearance has changed and it has been anything but easy to get used to this change. Over the past year I’ve been uneasy about how to interact with peers, and about how to deal with compliments. I’m ready to move forward as the new Jessica, to reflect on who I’ve been, who I am, and who I want to become, and most of all to become comfortable with my new looks while remaining true to myself. This week I was contacted by staff at Equinox and the New York City Parks Department after I sent my story of successful weight loss to Shape Up NYC. In one of my first posts I highlighted the free aerobics classes offered by Shape Up NYC, and I know that I would not be where I am today without my fitness instructor’s Lynze Schiller/Jenn Hamlin and the community of my Harlem Hospital Shape Up NYC class. In the coming weeks my story will be published, and I hope that those seeking change can find motivation through my experience. I’m looking forward to a new future now, and I hope to continue helping others with their weight loss goals by becoming a Certified Personal Trainer. I have a lot of work to do in the coming weeks, and I’m excited to move forward on a new path personally and professionally! Life is a difficult journey full of ups and downs, of successes and mistakes, but most of all life is an ongoing lesson. I’d like to share with readers a song that helps me through challenging times, a song that pushes you when you think you have nothing left. To friends and readers who are experiencing difficulties: listen and share if you find comfort in these lyrics.